Solar lighting technology has advanced recently, and now offers better lighting at reduced prices. Installing solar is far cheaper than equivalent mains powered lighting. 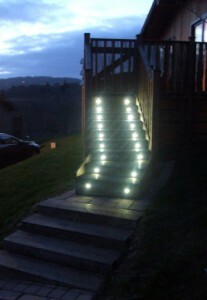 Solar lighting is ideal for inaccessible and remote locations that don’t have a convenient 240 volt supply. Power consumption requirements have been reduced with the use of LED bulbs, which also give increased illumination. Direct sunlight used to be a necessity for solar lights to charge enough to work properly. Harvesting the suns energy has improved greatly. Solar technology is developing fast and is expected to continue to do so. 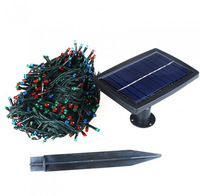 You have several style options for garden solar lighting. Lanterns for wall mounting. Lighting for post or hung style applications. Different colours and designs of fairy light strings. Deck lighting for recessed mounting. Solar spot lights with PIR for security lighting applications. In order to work at their best, integrated lights often require more light for longer periods as their solar panels are small by design. Solar lighting with external panels will usually charge faster and be more reliable because the panels are larger and can be placed in the best location to harvest energy. Operational performance of the best solar lighting can easily be improved by replacing factory fitted rechargeable batteries with high quality ones which will hold a charge for longer. The batteries that are factory fitted are bought on price, rather than performance which is what you want. It is important to position your solar lights correctly. Direct sunlight is the best light energy your lights can have, so make sure you position them where they will be able to harness all the direct sunlight possible. Too much shade for your lights will reduce their performance significantly. Shadows & shade will reduce the ability of your lights to charge effectively, so position them carefully. Advances in renewable technologies such as solar power are set to further improve lighting performance. Annual solar light sales grows year on year and is set to keep doing so. This entry was posted in Garden Lighting on June 6, 2014 by admin.